In the 1800s and well into the early 20th century, tired mothers in the United States and Great Britain, just like today, longed for their teething babies and toddlers to sleep through the night and for needed rest for themselves. What they didn’t bargain for was that the available remedies could be deadly. What today is considered a Schedule II narcotic by the FDA, which means it’s a controlled substance with great potential to become addictive, was a common ingredient in “patent” medicines. These concoctions weren’t patented by the U.S. Patent Office, but were often trademarked. The deadly, hidden ingredient I’m talking about: morphine. Without the modern conveniences of electrical appliances and lighting, dishwashers or microwaves, to quickly heat up prepared foods, they were at a greater disadvantage than today’s average mom. Unfortunately, without full disclosure on the ingredients in many prepared remedies, they most often didn’t understand what they were dealing with. During the late 1840s, Jeremiah Curtis and business partner, Benjamin Perkins, of Maine, began manufacturing and marketing a formula purported to be concocted by Curtis’s mother-in-law, Mrs. Charlotte Winslow. She had been a nurse caring for babies for many years. Her syrup was created to relieve the symptoms of teething. Advertisements touted that the syrup would relieve teething pain, “soften the gums,” help the child to sleep peacefully, stop diarrhea, and as one ad said, the “cherub” would “awake as bright as a button.” Morphine, indeed, is prescribed to relieve pain, would certainly make a child sleepy, and cause constipation. 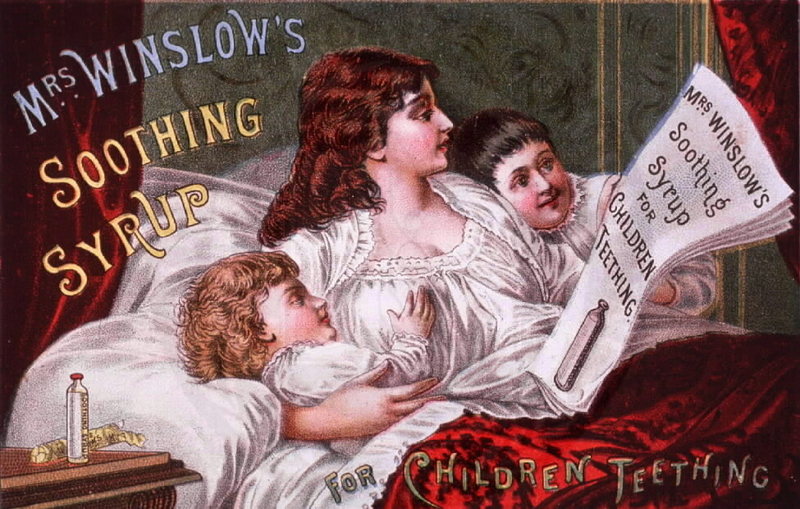 Mrs.Winslow’s Soothing Syrup also contained alcohol. The attractive ads and testimonies of happy parents spread the popularity of the patent medicine. Sadly, an infant or small child could be easily overdosed, dangerously slowing their hearts and causing accidental death. Such a strong narcotic was also likely to cause an addiction early in a child’s life. 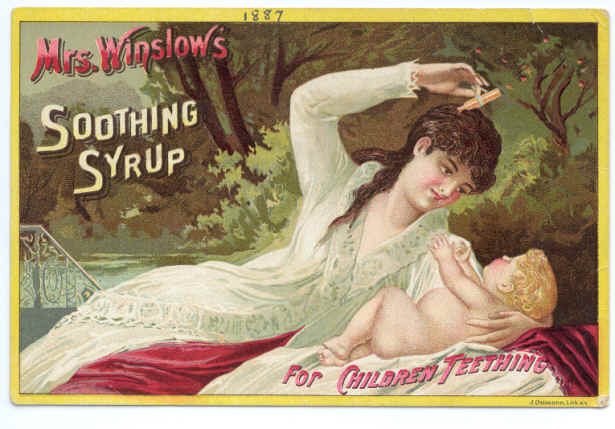 By 1911, the American Medical Association exposed the syrup as potentially dangerous, labeling it a “baby killer.” Mrs. Winslow’s Soothing Syrup was sold until 1930. Today’s mothers have the opportunity to search out the truth and correct information, assisted by the fact that ingredients must now be listed on the label. While there will always be the potential for human error, reading labels and opportunities to ask questions of your local pharmacist gives a level of protection they didn’t have more than a century ago. 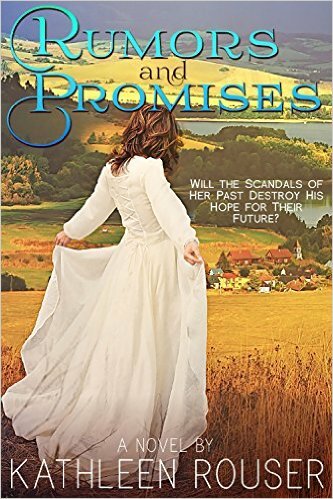 Rumors & Promises - Will the scandals of her past destroy his hope for their future? How scary is that! They were drugging their children and didn't even know it? Or perhaps some did know it and didn't care because they wanted to keep their child quiet and subdued. Sadly, I am sure that some parents today still use some meds too often to keep their crying babies quiet. On another note, I too home-schooled my three children...from K-12. Some of the best years of my life. Thanks for the interesting post. Hi chappydebbie, thanks for leaving a comment. There was certainly a level of trust that since it was called a medicine it was okay to use to soothe their children. From their aspect, it worked, so they trusted those that marketed the product, not necessarily realizing there was anything dangerous with it. For example, women who promoted temperance often took tonics that were filled with alcohol or narcotics, but since it was labeled as "medicine" didn't have a pang of guilt! I agree, being a mom and homeschooling were some of the best years of my life as well. A sad piece of history causing innocent parents to lose their children at a young age due to the medicine. Thank you for sharing, Kathleen. Many people complain of social media and even news outlets but we are blessed to have the ability to learn about things (or people) that put our children in jeopardy! Thanks for sharing this fascinating posy8.